Gently polish, purify, and prep your skin with this 3-in-1, soap-free, pH-balanced cleanser. Suitable for all skin types. Discover radiant skin in an instant. Our 3-in-1, soap-free, pH-balanced cleanser combines a patented blend of vitamins and polyphenols plus exfoliating algae to gently polish, purify, and prepare your skin. Face the world with the radiance you were born with. 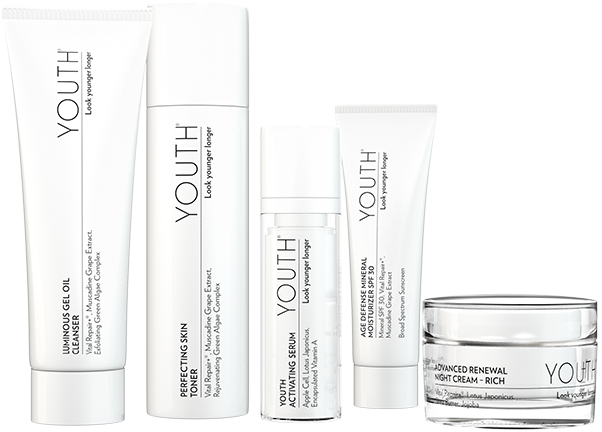 YOUTH® products are all 100% vegan and cruelty free. Dispense a pea-sized drop of cleanser onto hands and work into a very light lather. Rinse thoroughly. This 3-in-1, soap-free, pH-balanced cleanser combines a patented blend of vitamins and polyphenols plus exfoliating algae to gently polish, purify, and prepare your skin.